Ground turkey has become our new best friend. I have switched to using more ground turkey and less ground beef. I do this when I don't have access to grass-fed beef in my freezer or it is not on sale at the grocery store. It is more cost effective on my budget and a good healthy choice for my family. Our family would eat curry daily. We do enjoy all types of curry. My husband makes a great japanese style curry. I lean more toward the Indian curry combinations. I buy a good quality yellow curry powder for basic recipes like this one. At H Mart (they sell Indian Food too) we are able to find a good selection of curry powders and paste in our area. I wish I could find an Indian grocery store because I would love to add a few more ingredients to my cupboards with an Indian flair. H Mart only has a small aisle. 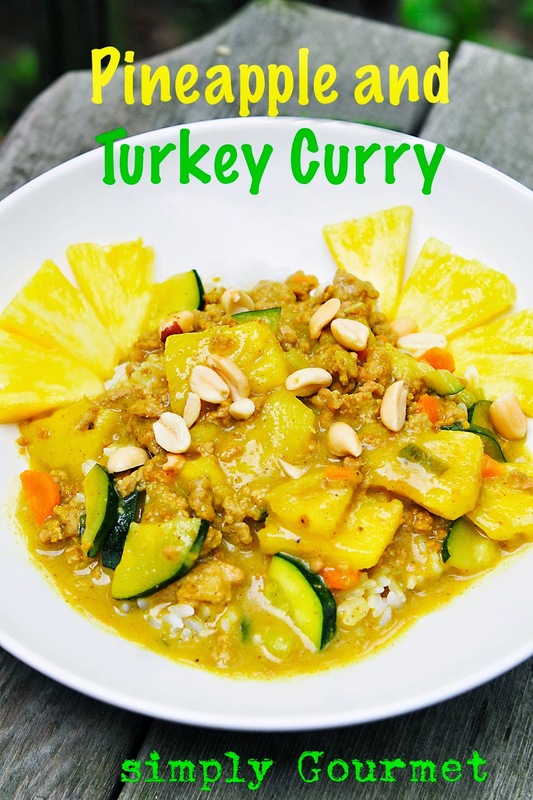 This particular dish of Pineapple and Turkey Curry reminds me of a dish I had in Hawaii when we were on vacation a few years ago. We visited the pineapple farm on the island of Oahu. Fresh pineapple from the islands was something I ate every day. We found curry to be a popular dish is some of the local eateries around the islands. I have added a few ingredients that we like in our curry's to make it our own. Our garden is producing a lot of zucchini and this is a dish that features it well. The green and yellow together just feel like summer. This dish is gluten free. To make it paleo don't add the peanuts, peanut butter or serve it over rice. You could substitute the rice for cauliflower rice. You could use almond butter in place of the peanut butter. A vegetarian conversion would be to eliminate the ground turkey and use a firm tofu instead. Just dice the tofu into small pieces. I use tofu often in our curry dishes for our vegetarian friends. Summer is almost over in our part of the states. The Farmer's Almanac is forecasting a white and wet winter for the East. BOO HOO! This is a great dish to add to your family's dinner to remind you of summer and the warmth that the sunshine brings. 1. In a large skillet melt coconut oil. Add diced vegetables and cook for 4 minutes. Add ground turkey and cook until meat is not pink. 2. Add spices, curry powder, peanut butter and coconut milk. Stir well and simmer for 12 minutes. 3. Add fresh pineapple and serve immediately with rice. NOTE: This is a dish that you can adjust to your family's preferences. Taste and cook as you go. My family likes our curry to be strong so I use the 3 tablespoons we also like the peanut butter so I might add more than the 1/2 cup. Same with the honey, if you like it sweeter add a bit more. This looks amazing! 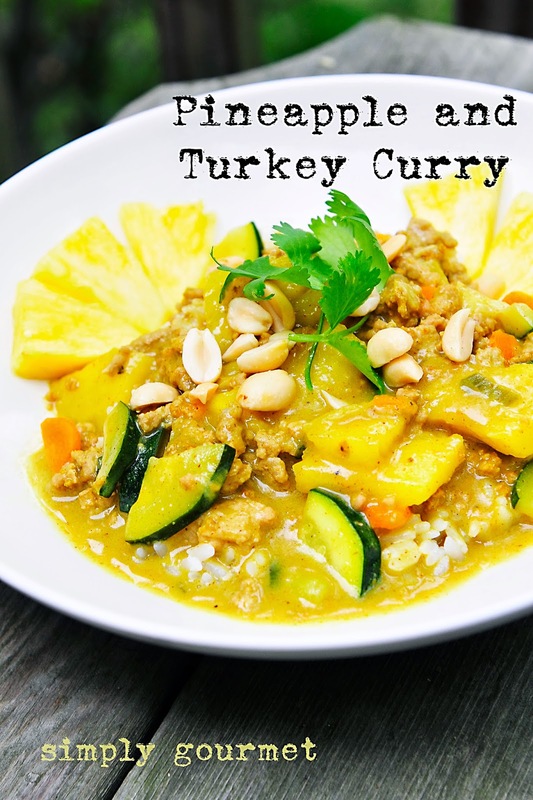 I love curry and the combo of pineapple!